They are such great gifts from Zara. 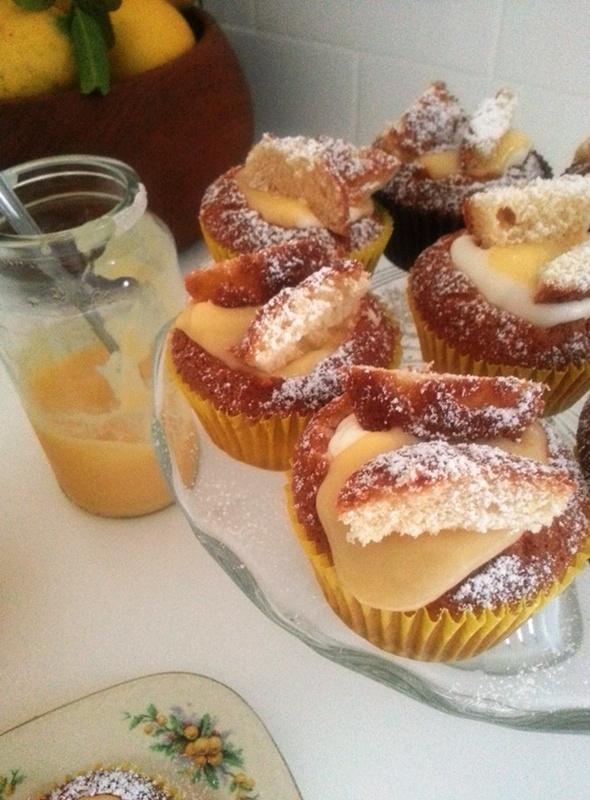 And lemon curd/butter fairy cakes are a favourite here too. Yum. Yum - I adore lemon curd. I just finished a pot of homemade yesterday, bought from a little old lady at a local church fair 2 weeks ago. It was sooooo good. My favourite is from Fortnum and Mason's but heck it's expensive. I've been plotting to make my own - just need to remember to buy some lemons. On the weekly shopping list now. Also, last week I went into an antique glass shop, owned by a chap who is the BBC Antique Road Show glass expert, and he has a set of glasses for sale that are a larger version of your Aslak Schnapps Glasses, and they are priced at £88. So you did good! 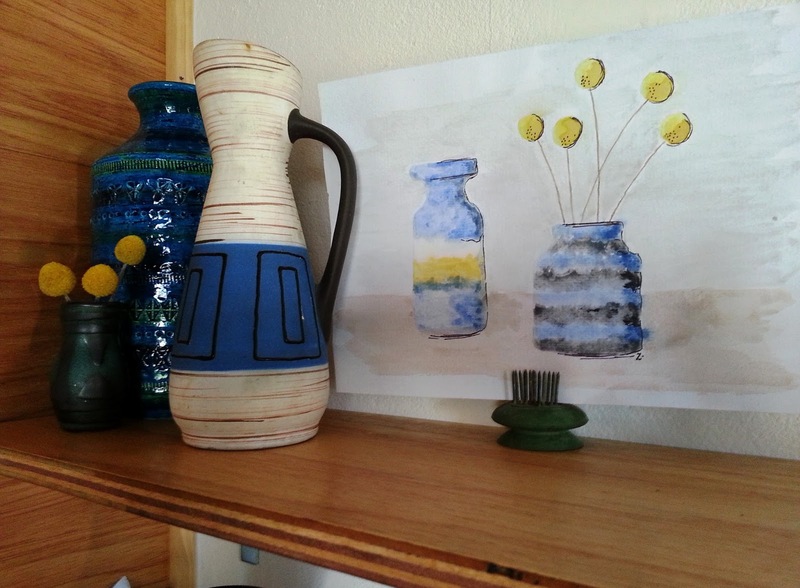 Ah now, saddo vintage ceramic spotter here, the crockery depicted in that tea towel is by Portmerion, I think by memory it is called Greek Key. I love it and have a few pieces of it.... somewhere. 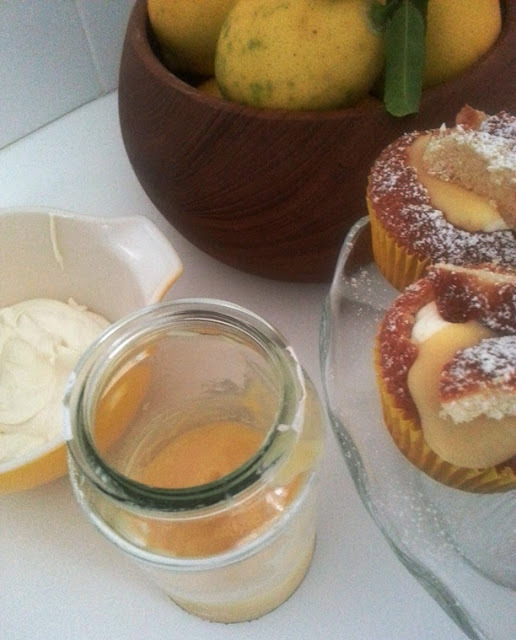 YUM those lemon curd cupcakes look bloody delicious. The cushion is ace and the cake pics have made me NEED a cake NOW! 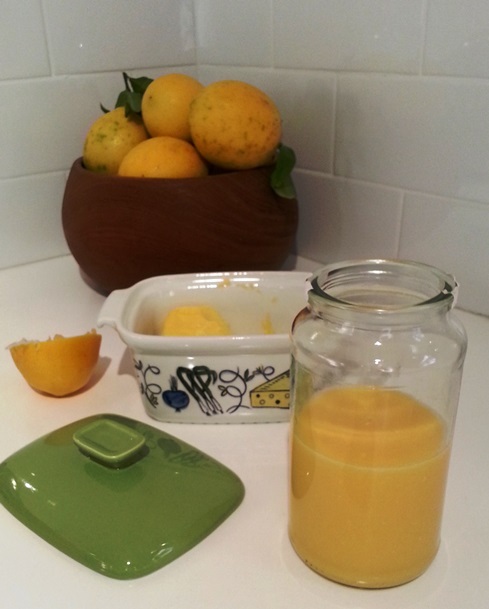 I've never made lemon curd before - might just give it a try! 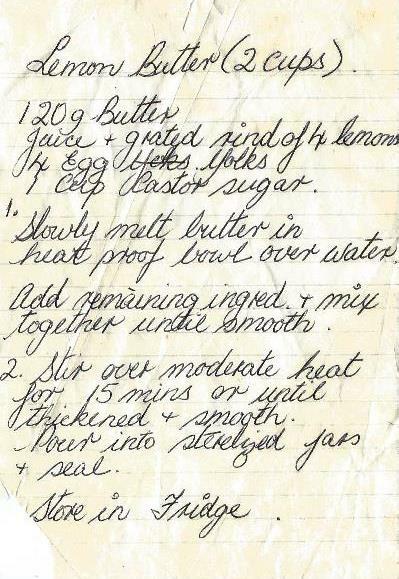 I love lemon curd, and your mom's hand-written recipe is great! 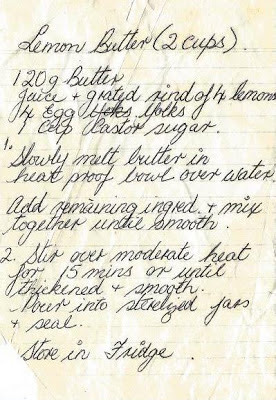 I have a hand-written recipe book that I did in 1965 in very girlish handwriting (when I was 17) for my hope chest. My daughter will get it someday. Your gifts from Zara are beautiful! You are a lovely person, so you get lovely gifts! 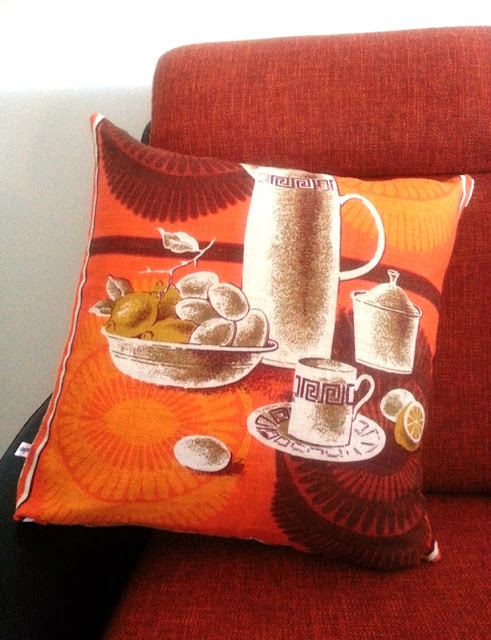 Very nice of Zara to send you such a great cushion and picture. She seemed to be a very talented person! Oh, that looks too yummy for words!!! I'll be sure to try your mom's recipe, there's something really trustworthy about our mom's recipes, isn't there? All the goodies look right at home at your place. So glad you like them. I've got another batch of these cookies on the 'to do list'. the icing glaze is messy but oh gosh they are delicious, like so delicious you keep going back for seconds, and thirds. Love lemon butter! I have never made my own though. I buy it regularly from our local hospital oppy made by lovely old ladies experienced in lemon butter making. 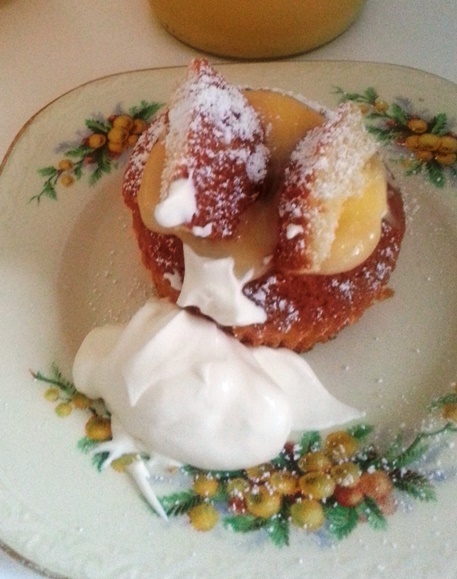 I have only ever had it on toast..your butterfly cakes look so good! Zara's piece is beautiful as is she. Seem to always be thrifting [dont really care for that word but how do you say it in 'Strine?] lemony type goods for some unknown reason. I've never made lemon curd or butter either but I posted a Jamie Oliver recipe last year on a very pressing citrus based issue. Wish I had had your Mums instead. Love it, handwriting and all. Will have to give it a go someday. By way of sterilising will a washed up and scalded jar suffice? What a lovely parcel of joy. Those fairy cakes look heavenly. As already established, anything lemony is good. I love your mother's handwritten recipe, such a beautiful hand she has. Zara does have exquisite taste doesn't she? We get piles of lemons from the parents,albeit weird looking bush lemons.I freeze the juice in icecube trays and freeze the zest for months to avoid the expensive ones. Those fairy cakes look delish!